Get your students thinking deeply while they’re taking notes—and show them how to make the most of those notes later. In my practice as a professor, I’ve noticed an anecdotal difference between the notes that my A and C students take during lectures. According to one study, students who take notes in an interactive fashion are more likely than those who record what they hear verbatim to be engaged in metacognition (thinking and evaluating one’s thought processes and understanding) and self-regulation (managing one’s behaviors for optimal results). And these two processes are more likely to lead to deeper processing. The good news is that teachers can show their students how to take better notes. 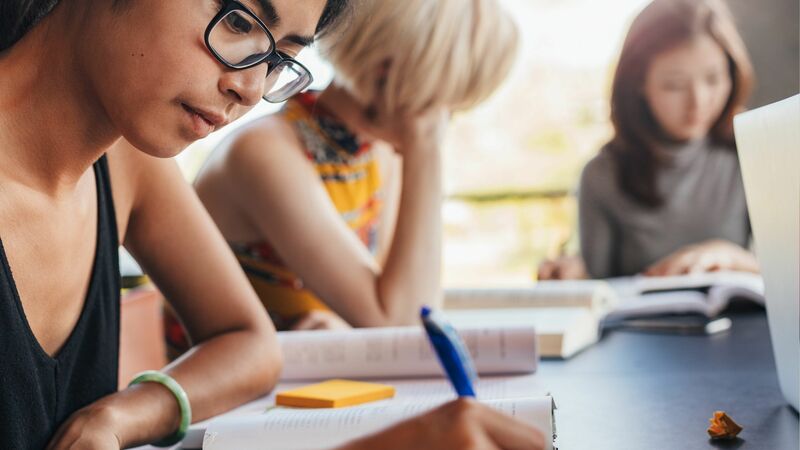 Even better, good note-taking activities are themselves learning processes that can help students think metacognitively about their own studying, and can improve their retention of course material. A virtuous cycle! 1. Organize the blank page. Many studies have attempted to determine how students should engage with their notes after class. One of them found that the best use of class notes was to create original summaries of those notes. The next best was to create original questions about the material that had just been covered. Here’s a great way to guide your students to do that: Have them draw a line down each sheet of paper they’ll use, making two columns. One column should be one-third of the width of the paper, and the other should be two-thirds. Tell students to take notes in the wider column, leaving the narrow column blank. After class is over, students should use the blank column to create questions or summaries about the material and use the questions and summaries to quiz themselves on the lecture notes. Questions should be at higher levels on Bloom’s taxonomy. Students should aim for questions that are not merely factual—they need questions that apply the material they’re learning (e.g., How could I use Dr. Rich’s article to improve my understanding?) or integrate the material with something they learned from another source (e.g., How is metacognition similar to critical thinking?). 2. Putting in time is important. You can’t make them do this, but strongly encourage students to set aside dedicated study time to review notes, reread summaries, and answer the questions they created about their notes. 3. Pen beats computer. According to a study by Pam Mueller and Daniel Oppenheimer, the act of taking notes in longhand involves deeper processing than doing so on a laptop or tablet. Typing on a device tends to be mere transcription, while longhand involves summarizing and interpreting. 4. Make use of the margins. When students have comments or questions about the material as it’s being taught, they should write them on the edges of the paper, so that they don’t clog students’ working memory. This allows your students to focus on the content more fully. 5. Rereading is essential. When students reread their notes and the textbook, they should add additional comments about how those two sources can be integrated. For example, when the textbook discusses a term, they can write a few words in the margin about the example you used during class. When the notes provide a description of a concept, they can write a new note about a point in the textbook that illustrates that concept. This practice requires them to think about course concepts at a deeper level, which should lead to easier recall and better understanding. In general, the more your students study to understand the concepts and overall message of your course material, the more likely it is that they’ll perform well on exams. In a study by William Balch, two sections of the same college course were approaching an exam. In one section, the professor informed the students that they’d be receiving a multiple-choice exam. In the other, the students were told that they’d be taking a short answer/essay exam. In the end, all students were given a multiple-choice exam, and the ones who thought they’d need to write long answers outperformed those who prepared for a multiple-choice exam. Studying for long-form questions presumably encouraged that group to understand and process information at a higher, more conceptual level, while preparing for multiple-choice led the other group to memorize facts and terms. Since the students who studied at that higher level understood the material for its meaning, they were able to decipher the answers to questions that required recall. 6. Use abbreviations for speed. Have students brainstorm or find abbreviations they can use for recurring words so they won’t need as much time to write them down when taking notes—for example, “b/c” instead of “because” or “chem” instead of either “chemistry” or “chemical.” They can save a lot of time this way, allowing them to capture more of the content as it is delivered.